Rolwaling Tashi lapcha pass trekking is challenging treks in Nepal. Rolwaling tashi lapcha pass trek combine beautiful Rolwaling valley, Tashi lapcha pass trekking & explore Everest base camp trekking trails. Rolwaling Tashi lapcha pass trekking offers superb views of Mt. Everest 8848m , Mt. Lhotse 8516m, Mt. Nuptse 7855m, Gaurishanker 7145m, Dorje Lakpa 6988m, Langtang Lirung 7246m, Ama dablam 6856m, Thamserku 6623m, Kusum Khangaru 6679m, kwangde 6090m , Twache 6637m, Cholaste 6640m etc, Tibetan Sherpa culture, mixed culture & Rhododendrons forest. Rolwaling Tashi lapcha pass Khumbu trek provides an experience the remoteness of this region, romantic mountain views, diverse flora and fauna and rich local cultures. Tashi lapcha pass trek requires a good walking experience and a good physical form. There is technical route in Tashi lepta Pass. One should have a peaks climbing permit for this route. Rolwaling Tashi lapcha pass trekking commence from Charikot/ Dolkha after 7-8 hours drive from Kathmandu. From Charicot the route to Rolwaling Valley and Tashi Lapcha headed up the scenic, steep-sided valley of the Tamba Khosi. High waterfalls cascaded from the heights and rudimentary bridges crossed the many side-streams. Ahead, the twin summits of Gauri Shanker, once thought to be the world's highest mountain, provided a prominent landmark.After cross the Tashi lapcha pass , you may climb the pachermo peak. Pachermo peak is famous and technical trekking peak in Rolwaling region. 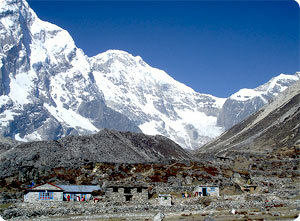 Finally trekking heading to Namche bazaar Lukla which famous trekking trail of Mt. Everest base camp treks. Splendid breathtaking place: Langtang Himal, Dorje lakpa , Gauri Shankar , Everest and relaxing with different culture. Day 01: Arrival in kathmandu 1334m, Himalaya Journey Treks & Expedition’s representative will transfer to hotel , Rolwaling Tashi Lapcha pass trekking briefing with officially arrangements. overnight at Kathmandu. Day 22: After breakfast, our tour guide will take to for historical monuments sightseing in kathmandu valley such as Bhaktapur, Pasupatinath, Boudhhanath, Kathmandu durbar square and Monkey temple(swyambhunath) and in the evening farewell dinner in Restaurant, overnight at kathmandu in Hotel. Day 23: After breakfast, Relaxing/shopping with own activities ,Himalaya Journey Treks & Expedition’s representative will drop to Kathmandu international airport for onward destination.